NBA players airplane left with huge dented nose after it collided at 30,000 feet with an unidentified object. Please do remember that UFO (Unidentified Flying Object) does not necessarily mean it was ET drunk-flying at 30,000 feet. Unidentified–officials do not know what it was. An object, well object stands for ‘a material thing that can be seen and touched’. Therefore, the plane collided with something that was flying and was real. Players from he US basketball team traveled onboard a Boeing 757-200 when it was hit by an object during the flight, leaving the airplane with a larger crater in the nose of the plane. The team was traveling from Minneapolis to Chicago. When the Basketball team landed, the found that the nose of their airplane had a massive dent. Adams wanted to solve the mystery as to what had collided with their airplane which is why he forwarded the images to NASA, Bill Nye, and astrophysicist Neil deGrasse Tyson, asking them to help solve the mystery of what could have caused the damage while their airplane was traveling at 30,000 feet. Carmelo Anthony reassured fans on Instagram that everyone was fine. 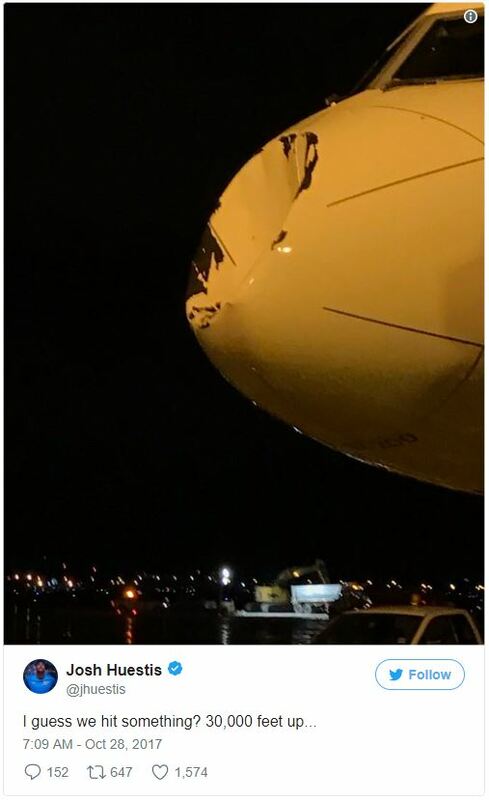 “What possibly could we have hit in the Sky at this time of night?” he wrote while posting another image of the airplanes dented nose. Patrick Patterson joked they had “accidentally hit Superman while flying”. What exactly the airplane hit in flight remains a mystery. A sensible suggestion is that a bird strike may have caused the damage. Delta Airlines confirmed the incident saying that no passengers were hurt. A spokesman for the company said that the airplane “likely encountered a bird while on descent into Chicago”. The question remains as to what type of bird may have caused such damage to the airplane’s nose. People on social media wrote “What kind of bird did that, an Ostrich? ?” after seeing the images. Several other users noted how the nose of the airplane did not have any traces of blood. “No Blood? Birds have blood and feathers…” wrote another user. Despite the fact that there are many who do not believe the airplane collided with a bird, and that there are no birds flying at 30,000 feet, the truth is that there are. Canada Geese have been seen at 29,000 feet, they could possibly fly even higher. Other even larger species have been known to fly even above 30,000 feet. However, whether or not the 757-200 carrying the US basketball collided with a bird or something else is up to officials to decide. If it were a bird or flock of birds, surely there must be some microscopic remenants of blood or bodily material in the paint flecks. Might have been either a small meteorite or part from another plane flying above it (how unlucky would you have to be for that to happen) or yeah…a government drone. No way it could have been a bird. No matter, they were all lucky it didn’t go through the windshield.